A martial art and sport of attack and defense, in which competitors wear boxing gloves and throw punches as in boxing, and kicks with their bare feet as in karate . Kickboxing is a martial art which was made for beating Muay Thai by Japanese boxing promoter called (OSAMU NOGUCHI) IN 1950 . He wanted to introduce to the Japanese people what he had seen in Thailand . Therefore, he sent some Thai boxers to Japan in 1966 and right after that, "Kickboxing Association" was found in Japan . He named the new martial art " Kick-boxing " . The first Kickboxer around the world is TADASHI SAWAMURA (real name : Hideki Shiraha) a Japanese Karate fighter . Kickboxing enhances coordination and fitness . Opponents are allowed to hit each other with fists and feet, hitting above the hip . 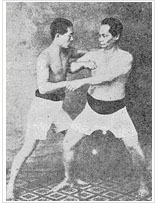 Using elbows or knees is forbidden and the use of shins is seldom allowed (unless it is in Thai boxing, where the knee is allowed ) . Kickboxing has been influenced by a combination of Muay Thai and other Martial arts including Karate and Boxing . Kickboxing is fairly new to the Western world – only about 30 years old compared to Boxing which is nearly 200 years old . In Kickboxing the outcome is determined by kick-knockout, knockout, judge's decision or draw, or a technical equivalent of the same, much as in professional boxing . Participants are required to wear padded gloves and foot gear, and must execute a specific number of above-the-belt kicks per round . Chokes, head butts, knee and elbow strikes , biting, holding and striking, and striking when an opponents is down are prohibited . Matches are conducted in a 16-20 square feet roped ring, similar to boxing, and range from 3 two minutes rounds (for amateurs) to 12 rounds (for professional world championship) in length , with one-minute rest period between rounds . Each bout is controlled by a referee, monitored by an attending physician , and scored by three judges. The introduction of padded gloves and foot gear at the sport's inception to minimize unsightly facial cuts .